This face editing prototype is an ideal testbed for investigating the practicality of open sourcing the rest of the Storytron technology. It’s only about 1500 lines of Java code, but I cut a lot of corners in its development so a proper version would probably be larger by some order of magnitude. I propose making this source code available with one caveat: I’m not going to simply place the existing code in a repository somewhere. It’s written in Java and the cruel truth is that Java is no longer a mainstream language (only “techies” can install Java on their machines). This would prevent the Face Editor from being useful to a large chunk of the public. But, as I wrote earlier, I will not do this myself. I want to see some commitment from the community. I want to know that I’m not just talking to myself when I write these posts. We’ll discuss this thing for one week. All specifics are open for discussion. On Monday, June 16th, we’ll end the discussion and I’ll assess the responses. If the discussion fails to generate enthusiasm I’ll set aside the issue of open sourcing the Storytron technology for a later date. First, use something like Github for your source control (they have private as well as public repositories). I think LiveScript is better than CoffeeScript. I found a variable scoping issue with CoffeeScript that made me run for the hills. LiveScript is like CoffeeScript but not only fixes this issue but adds numerous other improvements to the language. The way 3D animators make faces is they sculpt their mesh into several different forms, each one representing a different extreme for one part of the face. They would have a face with raised eyebrows, a face with a big smile, a face with a big frown, etc. Then once all of these were made, they make each one into a blendshape. So if you want a character to smile just a little bit, you apply the big smile blendshape, but only (say) 25% of the way. That way it pulls the vertices 25% of the way toward a big smile. This same blendshape idea can also be used to specify different kinds of faces (as in the variable eye separation, mouth width, etc. in the Siboot face diagram). If that’s too complicated, there is a much simpler way, namely creating “bones” that manipulate the polygons. Raising an eyebrow is a simple matter of lifting the correct joint. 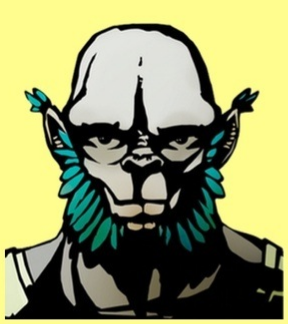 This method could also be combined with the other method; for instance, using blendshapes to model the varying facial structure among actors, and using bones to model facial expressions. Either of these techniques could be used with 2D faces, because there’s no rule that says polygons have to make use of all three dimensions. Keep in mind that creating the face is the hard part, and it only has to be done once. For something like a generalized cartoon face, the user needn’t even do it themselves if we do it for them. After that they’re left with the easy part, which is pulling various features around and making faces with them. I think for this project to be worth the effort, it would have to represent a significant improvement over the techniques already available. Look at how expressive the character is! 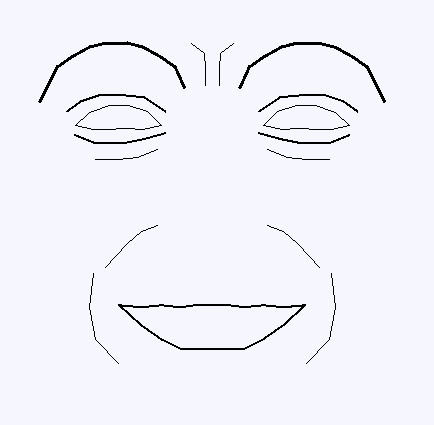 Check out Ken Perlin’s Responsive Face demo (Java plug-in required). Update: Doesn’t appear to work anymore in modern browsers (see below). Here’s a link to a YouTube video. Bill does this work for you? I’m using Chrome + latest Java version and it freezes on me. Very frustrating, though there are videos on YouTube of the demo. Alex, It doesn’t work for me even on a machine that has the Java plug-in installed. I’m using the latest Chrome and have Java enabled. Too bad, it’s a cool demo. When I get time I might fool around with trying to get it working. I’ll let you know if I succeed. I think that you’re 100% correct on the importance of faces, Chris. They pack an emotional punch that almost no image equals. A cheap, expressive 2D face tech is a very interesting prospect. This is tricky. I’ve done a very cursory survey of face tech and most of it is 3D. In other words, you pretty much need to hire a 3D artist to make it work. This makes me very nervous as a developer, since 3D is a bottomless pit where money and effort can be poured endlessly. So, 2D is actually an advantage. Now, how flexible is the tech? It looks like an excellent fit for what little I’ve seen for Siboot images. My only concern is that it’s tied very strongly to the art style. Here’s a pointed question: why is this superior to me asking an artist to draw 10 expressions for every character? They’ll do a better job and I’m not certain that it will be that much slower for a skilled artist. The only benefit I can imagine is dynamic expression blending/animation (e.g. microexpressions). Now let’s talk specifics, and I’ll be very straight with this. My personal interest is in making a great game with “real characters” (still deciding what the heck that means to me). The flip side is that I’ve little interest doing work for someone else’s project, unless it will be useful to me down the road. I’m certainly curious about your face tech and I want to play around with the Java face code. If it meets my design goals, I would port it to C++, which is what I use myself. HTML is a promising platform, but it’s still gestating and I have zero experience in working with it. You know, Alex, for Gossip I did exactly what you describe: I had an artist draw ten expressions for each of six actors. It was slow and expensive, but most important, it restrained my efforts. Once I had decided on those ten expressions, I was locked into them. Expansion just wasn’t in the works. This is especially important for communicating intensity of emotion. There’s a whole range of expressions between “slightly annoyed” and “furious” and you need all of them. Yes, there is a danger that any such system will be too closely tied to a particular art style. That’s one of the major issues that we’ll need to address in designing the general-purpose version of the technology. And yes, the whole point of this is to make something that people can adapt to different products. I’m a bit confused by the “works on a majority of computers” requirement. I guess what I’m saying is that obscurity is more dangerous than obsolescence. Hmm… Funny, I’ve always thought that it is obvious that the world is moving towards a web-centered environment. Back in the 90s, they were expecting that operating systems would be replaced by web-based systems. All you’d need was a machine with a basic web capability, and it would download whatever OS portions it needed as it needed them. Java was expected to be a major component of this. Microsoft took this threat so seriously that they went into all-out attack mode and did everything possible to stamp it out; I believe this is where the “Embrace, Enhance, Extinguish” slogan arose. Microsoft succeeded in deferring that, but it remains inevitable. (Microsoft has done more to retard the computer revolution than any entity on the planet.) Already we’re seeing lots of processing smeared out between the user device and the web, the best example being Siri. The app on the iPhone does only speech processing, sending speech codes back to Apple, where the heavy-duty AI resides. Is Siri an app or a service? The two blend together. Google is pushing hard in this direction, replacing on-board apps with on-web apps. This process will surely advance. It therefore seems obvious to me that the web is the future, and that pure PC-bound apps are slowly being eclipsed. That’s why I think that everything associated with interactive storytelling must be fundamentally web-based. Programs in the various dialects of C are dinosaurs because they’re dedicated to a particular platform and cannot operate with catholicity. I know full well that I am ahead of the times. Hell, I’ve been writing a book as a hyper-document for the last 20 years, and I refuse to consider publishing it on paper, because I know that the future belongs to hyper documents. As a consequence, nobody reads my book. Too bad for me. Too bad for them, too. That’s certainly a fair argument. L.A. Noire touted its advanced facial technology, and I’m sure it was quite a marvel, but, for all the effort they put into it, I found the faces difficult to read. That said, I still can’t help but think there must be solutions that already solve the problem. I think the techniques I already mentioned would still work perfectly fine. 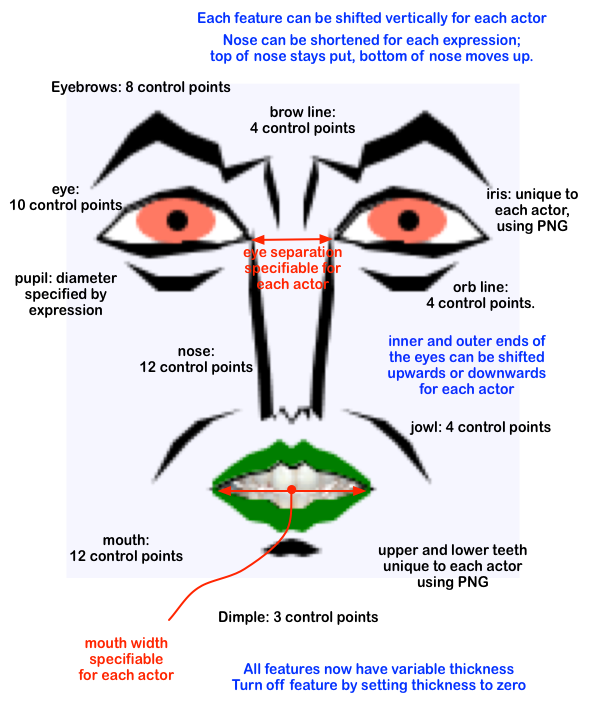 If I wanted, I could probably make an abstract face that perfectly matches the diagram in the post and is perfectly capable of accommodating any cartoony expressions desired without regard for physical realism. Moving control points and moving bone joints (in the animation sense of ‘bone’) are two sides of the same coin, I think, except the latter is a system that is already supported by myriad tools, many of them freely available. Well, what does obsolescence entail? The inability to find a compiler and a reference manual? I strongly doubt that will happen. That would mean the github repository would have to be taken down, as well as all the mirrors of the repository and its releases. And there’s no reason for the github repo to disappear unless github itself goes belly-up, which is quite unlikely. And we could always maintain our own mirror in case something happens. I’m of the opinion that the whole face issue is a rat hole. A great counter-example of this is Imgur. With one, count em’ one, good well presented face can move ppl’s hearts and minds really powerfully. The issue is not how do we generate faces, plenty of those (hell use meme generator faces/advice animals if you must), the issue is how do we use them. Having a good face editor is like have a good UI– a good thing for production, but not the point. Sure you want good thesbians, but you need great story first! Well, MTL, if you don’t think that faces are that important, then by all means refrain from volunteering for this project! Yes, of course we want good stories, and yes, of course, they must be our primary concern, but presenting the face is a critical part of good storytelling. Take any movie and count the fraction of frames devoted to faces. It’s huge. A third option – which meets the longevity and end-user-ubiquity criteria – would be to use Flash. Makes things a bit more restrictive on the creative side of the equation, but I seriously doubt that Flash is going away anytime in the next decade or three. Thanks for the comments, Twyla. I feel strongly that we should design for web deployment, because over the long run, the web is the future. It’s almost a certainty that at some point in the future, there won’t be Windows or Mac OS, just Web OS. This was Sun’s vision twenty years ago and I think that it’s still on the mark. Of course, ‘someday’ could be a long ways off. b ) The portable device market (smartphones, tablets, etc) evaporates. While both of these are potential possibilities, I honestly don’t see either occurring anytime within the next decade or two. I most certainly wouldn’t choose it for serious programming (I swear, sometimes programming in Java makes me feel like I’m trying to type while wearing boxing gloves) but, for applications such as this, Java is probably the strongest contender. Twyla, I don’t understand your comment about the JVM architecture, specifically “relied upon heavily for mobile devices in particular.” The JVM architecture might be the basis for Android’s Dalvik compiler but Java certainly doesn’t run on iOS or Windows Phone (though the JVM architecture may have influenced their design). Apple and Microsoft don’t exactly have a reputation for playing well with others – Apple is, well, Apple, and IE is the only non-compliant web client (no, it doesn’t qualify as an actual browser) out there – web developers have had to write hacks and workarounds for IE since forever. Even with that, Oracle solved the Apple dilemma almost two years ago and Java has been running reliably under iOS ever since. Java took care of the Windows Mobile issue way back in 2009. Twyla, Thanks for the info, I did not know that about Java and the JVM (I’m more familiar with the C# .NET world and when I think “cross-platform” I tend to think native apps instead of web client first). Chris, I vote for putting the Face Editor code out there in a public Github repository with instructions how to compile and run in Eclipse and see what happens. You gain some valuable experience with open source in an actual trial and it might take off. What have you got to loose? It looks as if we’re converging on releasing this in Java in its current form. I’m ready to run with this, BUT in the opening post of this thread, I said that I’d wait until Monday to make the final decision, so I’m going to give people the next 72 hours to get in other points or recommend some changes. 1. Messy/Clean. To what extent should I clean up the code, add comments, etc? Right now it’s in my tossed-together form and certainly needs some clean up. It’s teenager-bedroom messy, but can it be more like typical-bedroom messy or should it be more like barracks-room clean? Another way to express this question is, how many hours do you think 1500 lines of teenager-bedroom messy code should get in the way of cleaning? 2. Generalization. This thing is written specifically for a single application. I’m sure that people will add abstractions that increase its utility, but to what extent should I do some of this? Just for fun, here’s the class that draws the face, in its current messy form. I scrunched the tabs down to 1 space to make it a bit more readable. There it is. Now the whole world knows that, all these years, I’ve been faking it as a programmer! Hmm, that seems to have broken the formatting after the first public static code block. It’s fairly easy enough to navigate for a programmer nonetheless, although there seems to be a few too many closing braces at the end… I assume lines #428 and #340 should not be braces? Update: I fixed the formatting. Hopefully I got the indentation correct. Left braces at end. Well, with a repository on, say, github, there’s the option of putting it up as-is and allowing the community to clean it up with you, since you can “pull” others’ changes back into your own repository. github makes this sort of collaboration nearly trivial once (and this is a big “once”) you’ve gotten used to using git in general. It can get tricky if two people edit the same piece of code, though, since it can cause edit conflicts, so some coordination of effort might be necessary. Oh dear! very complex discussion here. I’ve been toying around with Chris editor for a while now and it’s very interesting and became very relevant when you understand Chris vision. I want to share some facts from my early mailing with Chris, just to wrap up some facts. This will let us digg deep on emotionally complex story design. Face expressions from characters will change live every time we make a decision. It will be dynamic. Hope this through some light to the discussion, and Chris I hope I explain it right! That’s an excellent summary of the goals of Face Editor, Alvaro. I hope that everybody pays close attention to those — I am highly averse to altering these basic principles. Does anybody see any problems with these principles? I’m a bit confused by the “No Animation” part. “Optimized for streaming” implies dynamic content, which would imply animation. If animation isn’t to be considered, it becomes static content which doesn’t involve streaming. If done right (similar to MPEG, where only the part of an image which changes need be conveyed), a simple update function is the only thing needed to include animation – potentially packaging a second’s worth of animation within the space needed to define the initial face. I could certainly see saving the animation component for a later date, though it seems to me that it should be a consideration for the initial development. You’re absolutely right, Twyla. We’ll keep animation as an option for the future, but remove its prohibition from our current design principles. This doesn’t look promising. I have spent the last five days rewriting the code to make it more flexible and more understandable, but given the tepid response, I don’t think it’s worth the time it would cost me to manage the effort. I’m going to hold off for a while. Perhaps we’ll get some more interest in it at a later time, at which point I’ll re-open the question.